Every day a student is absent is a lost opportunity for learning. Too many absences not only can affect achievement for the absent student but also can disrupt learning for the entire class. Attendance Works suggests five basic steps to address and reduce chronic absence in schools. Attendance improves when a school community offers a warm and welcoming environment that emphasizes building relationships with families and stresses the importance of going to class every day. The key is developing a school-wide school culture that promotes a sense of safety, respect and personal responsibility, where students feel connected and know that someone notices, in a caring manner, when they missed school. A key component of the engagement is helping families understand what their children are learning when they are are in school and the negative effects of chronic absenteeism on realizing their hopes and dreams for their children. Too many parents and students do not realize that just missing two days each month can be a problem, and often leads to falling behind in the classroom. Even fewer families realize that absenteeism is a problem as early as kindergarten and preschool and building the habit of attendance in the early grades can influence their children’s chances of graduating from high school. School communities can send a clear message that going to school every day is a priority by providing regular recognition and incentives to students and families who have good and improved attendance. Keep in mind that the goal is not to focus on perfect attendance since the children who struggle the most will soon be left out of such activities. Incentives and contests take advantage of the fact that students often respond better to positive recognition and peer pressure than they do to lectures from parents and teachers. Incentives don’t need to be costly. Simple rewards—recognition from peers and the school through certificates or assemblies, extra recess time, homework passes or even dancing in the hallways—go a long way toward motivating students. Ideally every school has a team to monitor their data, use it to organize their attendance improvement strategy and ensure chronically absent students receive support. The best way to identify students with chronic absence, is to use the attendance data already collective by schools to examine which and how many students are missing missing 10% or more of the school year. Ideally, data is also to monitor trends over time by grade and subgroup. Schools can also use data prior to the beginning of the school year to assess how many students are likely to need additional supports and then determine how to put in place sufficient resources . Attendance Works has created free data tools–the DATT and the SATT–to examine patterns and identify which students are at risk due to poor attendance. Link to DATT and SATT pages. The best approach is for district data staff to use these tools (or adopt exising data dashboards to produce similar reports) and then provide data on a regular basis to school administrators. If large numbers of students are affected by chronic absence, that suggests some type of systemic barrier or barriers are at play. Once it is clear that chronic absence is a problem in your school and for which groups of children, i use qualitative and quantitative information to examinewhat factors might be affecting attendance. If possible, engage other agencies and families in the process so they can use their insights to shed light on the challenges and get engaged in coming up with realistic solutions that draw upon the assets they can bring to bear. 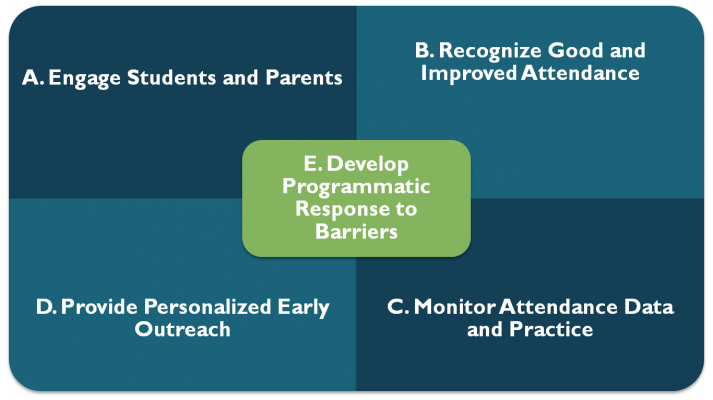 Identifying the barriers to attendance can indicate the appropriate solutions, whether that involves, for example, establishing uniform closets, improving access to health care, launching walking school buses, providing tutoring, offering mentoring, developing morning or afterschool care and other approaches.